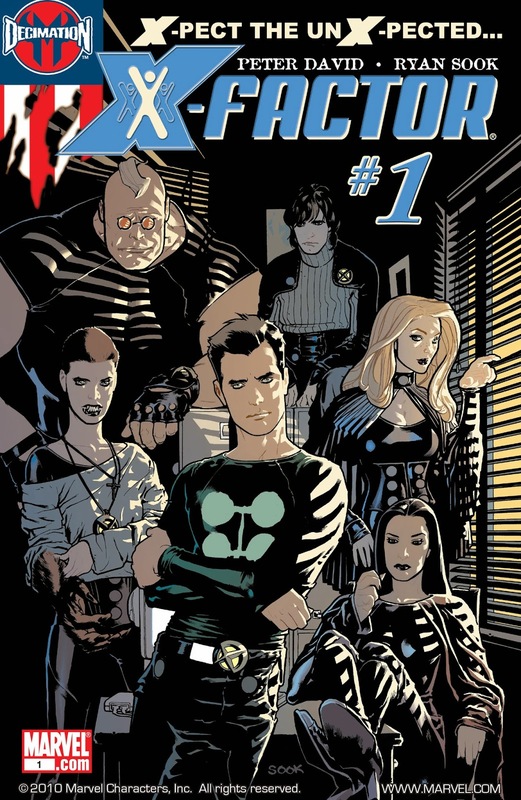 Jamie Madrox - the Multiple Man. Madrox is a mess, plain and simple. He has little confidence in himself and his ability to lead this team. But over the course of the series, you learn that he's much more capable than he gives himself credit for. What he lacks in confidence, he seems to make up for in an excellent ability to run on gut instinct. I guess that would be a great trait to have as a PI. Theresa Cassidy - Siryn (and later Banshee). Terry is very much the conscience of the team. She always seems to be the first to say if what they're doing is something she agrees with or not. Her character progression in the series goes from being a woman who mourns her father's death (in sometimes unhealthy ways) and ultimately ends with her becoming a goddess. Some of things that happen in between are sometimes funny, sometimes horribly tragic. Guido Carosella - Strong Guy. Easily the character I like the least. Every team needs a heavy, and I guess he’s going to be it. What I like least about him is his character design. The “I always skip leg day” look and the stupid tuft of hair on his head just make him look stupid. He does get a redesign as the series progresses, which improves things slightly. Monet St. Croix - M. Now this is a character I love. So much so, I included her in “Our Picks For the Best X-Men Team” article. She’s beautiful, brash, and arrogant. But she has the abilities to back it up. There are a couple of times in this run that her past, as Penance, come back to haunt her. Layla Miller - “She knows stuff”. She comes to the team as an enigmatic little girl that seems to know what’s going to happen and when. She has other abilities that are shown later that have very terrible consequences when used. She was introduced in House of M, but really comes into her own in this series. One of my favorite interactions with her is how she keeps telling Madrox that they’ll get married one day, sending a visible shudder down his spine everytime she says it. There are several other members that come and go, but these five are very much the mainstays of the series. Others that pop up in the run include Darwin, Havok, Longshot, Polaris, Shatterstar, Wolfsbane, and Pip the Troll. This series perfectly encapsulates everything I love about Peter David, as a writer. He tackles a myriad of issues in this series, such as mourning loved ones, homophobia, and religion. Sometimes they’re handled with subtle humor, sometimes they’re handled with the seriousness that the topic demands. David seems to navigate them with pitch perfect timing. He’s always been a master at dialog, everything said from one character to the other seems so real. If I were to compare his gift for dialog to any of his contemporaries, I’d say he’s in the same good company as Mark Waid or Brian Michael Bendis. If I ever do a “Best Creators That Don’t Get Their Proper Due” article (hint, hint: it might happen), he would most certainly be on it. When he suffered a stroke in December of 2012, I not only was concerned for his health, but I was worried that we may lose one of our most talented creators. Thankfully, he pulled through and continues to bring us wonderful stories. He’s been a true ambassador of the medium. I remember, back in the day, he was a frequent poster on comics usenet forums and he continues to engage his audience today on Twitter. Artwise, this series has been all over the place. Some artists were fantastic, most notably Leonard Kirk and others were just awful. Thankfully, the writing was strong enough to distract from the weak art on some of the issues and kept the series a cohesive whole. The verdict: A highly recommended series. I think volume 4 had the potential to be an even stronger series because I feel the characters were so much more interesting and had so much potential for some interesting interactions, but it wasn’t meant to be as it was cut short due to low readership. But this series was wonderful. I can’t say enough nice things about the writing. David is a creator I follow on whatever project he works on next. Track down these issues and have a great time!